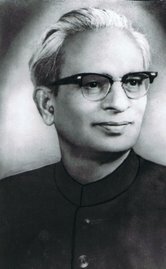 The Academy has the singular privilege of operating from a house consecrated through long years of residence by the great man from whom the Academy gets not only its name but its very raison d’etre. 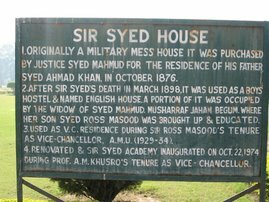 Sir Syed House was originally a military mess. 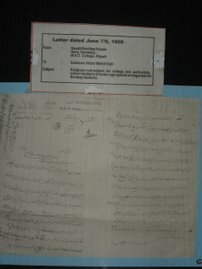 In 1876 it was bought by Syed Mahmood, the first Indian judge of the Allahabad High Court for the residence of his father Jawad ud Daula Arif Jung Sir Syed Ahmad. 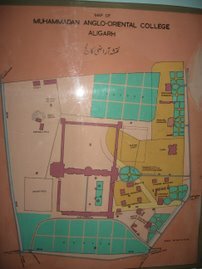 The bungalow, known as Sir Syed House, lay in a dilapidated condition till it was fully renovated and restored to its original grandeur in the early 1970S. 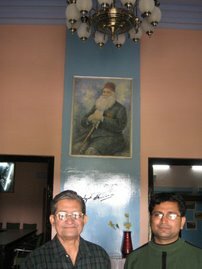 It was decided to Convert the Building into a memorial for the founder and house in it the Academy named after him. 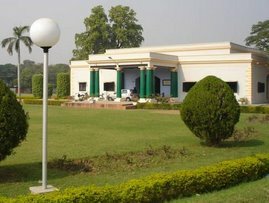 The Academy was inaugurated on 22nd October, 1974. 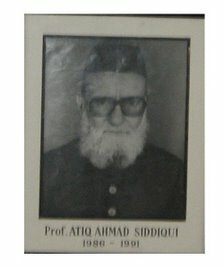 The founder Director of the Academy the Late Professor Khaliq Ahmad Nizami put the wh effort on a sound footing with his extraordinary interest andinowledge of the Aligarh Movement. 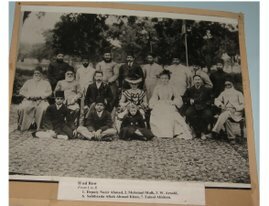 Since its inception the Academy has been trying to create an awareness and understanding about the tremendous contributions that Sir Syed made for the advancement of the cause of educational, technological, social and cultural development. 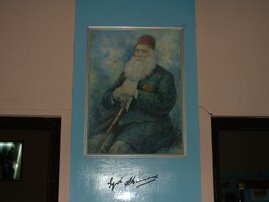 The Academy highlights the substantial effort of Sir Syed to promote unity and ha among the various comniunifies of this vast country and thus to champion the noble cause of nation building. 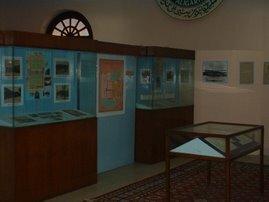 The first gallery aims at providing an introductory glimpse into the life and times of Sir Syed and his associates. 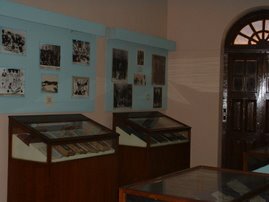 The second gallery tells through its exhibits the story of the various phases of the M.A.O. 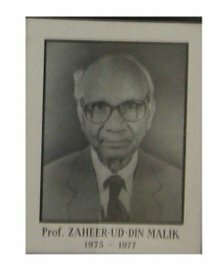 College. 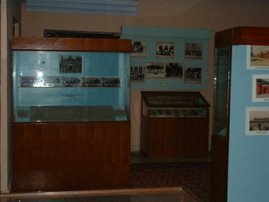 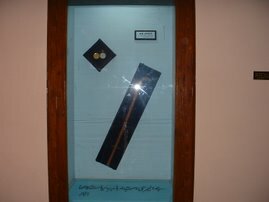 The third gallery presents a brief history of Aligarh Muslim University. 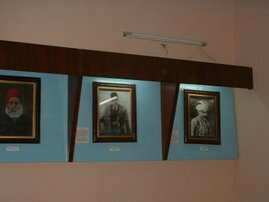 On display are the photographs of the Vice-Chancellors as well as those of the campus buildings in a chronological sequence. 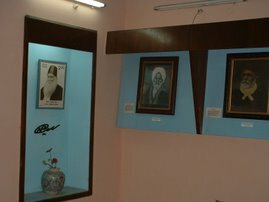 Three large portraits of the founder, his sons and close associates can be seen in the conference hall and the library. 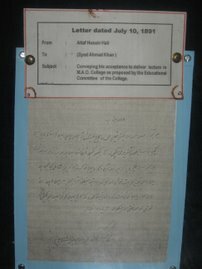 Besides the official records of MAO College, this section contains records of the various societies, projects and associations established by Sir Syed in a period of about Eighty five years. 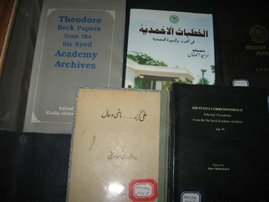 This set of records provides a wealth of source material not only for a study of Muslim educational activity from 1863 to 1947 but also for a knowledge of the contributions of many muslims to the country’s struggle for freedom. 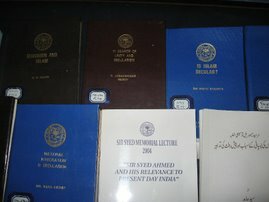 Translated from Urdu by Dr. M. Hameedullah, (Sir Syed Fellow). 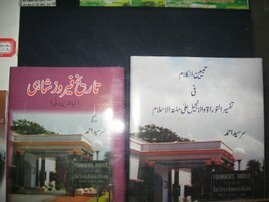 Translated from Urdu by M. Abdul Mannan, (Justice Syed Mabmood Fellow). 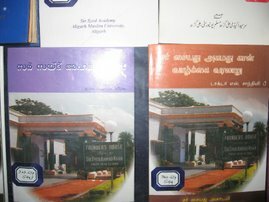 Edited by Professor lqbal Husain, Sir Syed Fellow. 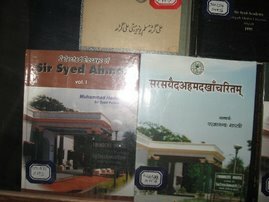 Edited by Professorlqbal Husain, SirSyed Fellow. 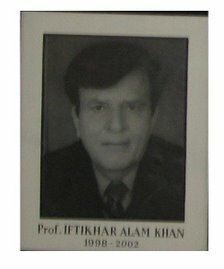 M. Abdul Mannan, (Justice Syed Mahmood Fellow).